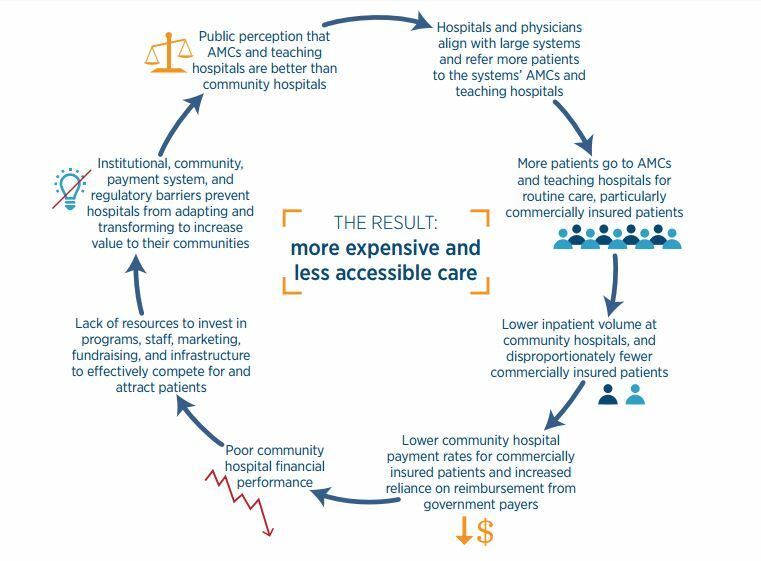 An illustration, titled “self-reinforcing challenges facing community hospitals,” from the report by the Massachusetts Health Policy Commission. Bristol Hospital President and CEO Kurt Barwis has been sending policymakers a report that paints a grim picture of the future of small community hospitals like the one he runs. 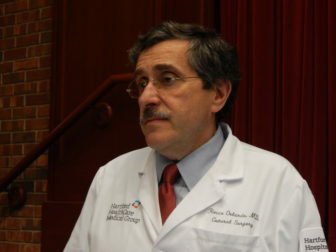 Based on more than a year of research, the report from the Massachusetts Health Policy Commission suggests community hospitals in that state face something of a downward spiral: Patients are increasingly seeking routine care at large academic medical centers or teaching hospitals, drawn by perceptions of quality or referred by doctors who are now affiliated with the larger hospitals. With fewer patients, the community hospitals lose bargaining leverage with insurers when negotiating payment rates. And with fewer patients and lower payment rates, the hospitals struggle to invest in programs, staff, marketing or the infrastructure needed to adapt to the changing health care system. “These challenges form a self-reinforcing cycle and make the traditional community hospital business and operating model unsustainable,” the authors wrote. In Windham Hospital service cuts, some see sign of the futureWhy one independent hospital decided to explore going biggerAs health care changes, can independent hospitals survive?Change to hospital regulation again looms – but direction unclearIn controversial health care bills, some agreement on transparencyYeah, CT health care costs are high, but which ones are highest?In shoreline cancer treatment dispute, questions about hospital competitionExpert: Transparency, savvy patients, competition key in tackling health care pricesLegislators grappling with fast-changing health care landscapeCritics seek hard look at Yale–L+M deal, hospital market powerCuts at Windham Hospital prompt worries about access to careHow well will new rules on health care cost transparency work? But if community hospitals close, they added, the consequences for the health care system could be significant. Not only would local access to care be reduced, but overall health care spending would rise. That’s because community hospitals tend to deliver care at lower costs than academic medical centers, which generally have higher cost structures that go along with their advanced capabilities. And if the lower-cost community hospitals closed, more patients would get care at higher-cost facilities, while reduced competition could result in higher prices at the remaining hospitals. “It’s a great portrait of what’s happening in Connecticut,” Barwis said of the report. Connecticut has just a handful of small, community hospitals that remain independent, the result of a wave of hospital consolidation in which many facilities joined larger health systems. Many in health care see joining larger systems as key to hospitals’ survival. But some policymakers are wary of the trend, warning that consolidation can raise the price of care without necessarily improving quality. And leaders of independent community hospitals say they’ve been left in a tough spot, facing stresses that could jeopardize their hospitals’ viability – and ultimately leave the health care system worse off. 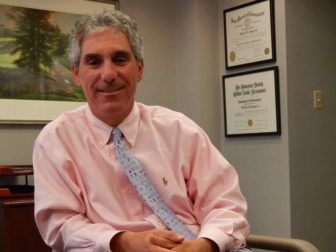 “Connecticut community hospitals are certainly under pressure to survive as independent community hospitals,” said Joseph Adiletta, president and CEO of Day Kimball Hospital in Putnam, which remains independent after two failed attempts to join larger systems. Some, including the Massachusetts report’s authors, see a way forward for community hospitals in the way the health care system is changing, an evolution that will, in theory, lead providers to be paid based on their ability to keep patients healthy – rather than just treating those who get sick – and to control costs. Such a system would reward hospitals that have strong connections with their communities and local social service providers – and that can deliver care at lower costs. But there’s a caveat: That shift in care delivery and payment hasn’t happened yet. Patrick Charmel, president and CEO of Griffin Hospital in Derby, thinks his small hospital will have an edge under such a system, but he expects it will take three to five years to develop – and he and his colleagues worry about the interim. “You’ve got to stay alive long enough to make it to the end, where you’re rewarded for all those things,” he said. Hospital officials from facilities of all sizes have complained in recent years that state policy is weakening their finances – particularly a state tax on the industry imposed in the 2012 fiscal year and reduced payment rates from Medicaid. Gov. Dannel P. Malloy’s administration has countered that many hospitals have enjoyed healthy profits and have benefitted from an increase in insured patients under the federal health law. 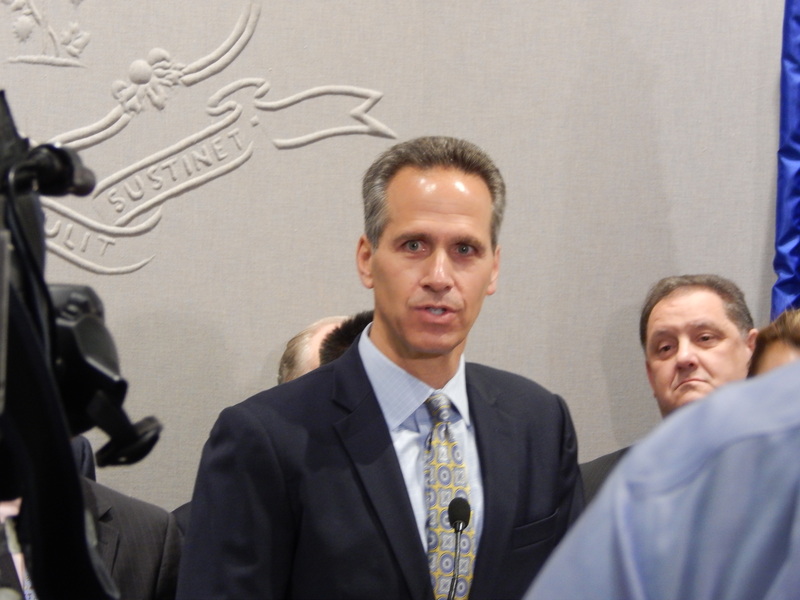 This year, the leaders of small hospitals are lobbying against a proposal by Malloy to eliminate an $11.8 million pool of state and federal funding that goes to five small, independent hospitals – Bristol, Charlotte Hungerford, Day Kimball, Griffin and Milford. They say it’s worthwhile spending to help insulate community hospitals that can deliver routine care with high quality at lower costs. But this year, with the state facing a projected $1.7 billion deficit in the next budget, the administration says the state can’t afford to maintain the small-hospital pool. “Given the state’s fiscal situation, we cannot continue to provide special subsidies to a select group of hospitals based on their size and lack of affiliation with other hospitals, particularly when this group of hospitals does not serve a greater proportion of our Medicaid clients,” said Chris McClure, a spokesman for Malloy’s budget office. He added that the administration would prefer to spend Medicaid dollars – the supplemental pool money comes from Medicaid payments – on Medicaid clients, rather than hospitals based on their size. Barwis said losing that funding could lead his hospital to “essentially be taxed out of business.” This fiscal year, Bristol Hospital was slated to receive $2.9 million from the small hospital pool, in addition to $1.5 million in other supplemental payments from the state. Both only partially offset the $7.5 million in provider taxes the hospital is to pay the state. Victoria Veltri, the chief health policy advisor to Lt. Gov. Nancy Wyman, acknowledged that community hospitals face a difficult situation. In Putnam, questions about Day Kimball’s future come up frequently from hospital staff and people in the community, Adiletta said. The hospital has tried to partner with the state’s two largest systems; both Yale New Haven Health System and Hartford HealthCare ultimately ended the plans, Adiletta said. Now, Day Kimball has something of a dual strategy. The hospital plans as if it will remain independent, but remains open to joining a larger organization. It also has more limited partnerships with other organizations, including one with the Yale New Haven system that allows it to purchase supplies at lower costs. While Day Kimball is open to a suitor, Griffin Hospital has been working on another way forward. Several years ago, Griffin officials decided to do what they could to maintain the hospital’s independence. To gain some of the advantages of a larger organization, Charmel began talking to other hospital leaders about joining together into something now called the Value Care Alliance, an attempt to gain the benefits of a larger organization – such as purchasing power and data analysis that can improve care quality – without becoming part of a formal system. Part of Charmel’s vision for the hospital’s future counts on the major shift away from the current fee-for-service system to one that pays based on outcomes and controlling costs. Griffin gets by on payment rates from insurance companies that Charmel estimates are 40 to 50 percent less than larger hospitals nearby receive – a result of its relatively low leverage in negotiations. Middlesex Hospital CEO Vincent G. Capece Jr.
Vincent G. Capece Jr., president and CEO of Middlesex Hospital, takes a similar view. And Capece said hospitals that have had fewer resources have had a harder time making the kinds of changes needed to adapt to the changing system, which requires more data gathering and analysis capabilities. The Massachusetts report’s authors noted that in many cases, patients bypass community hospitals that provide care at high quality to seek out larger facilities with better brand recognition. So how do community hospitals compete? “We’ve tried to address that by aligning ourselves with Mayo Clinic,” Capece said. The hospital belongs to a clinical care network that gives its doctors access to Mayo Clinic experts. That appeals to patients interested in brand name, Capece said, although he added that its value probably would be limited if there weren’t also substance to the partnership. One of the five hospitals in the small-hospital funding pool is already in the process of joining a larger system; Charlotte Hungerford is seeking regulatory approval to become Hartford HealthCare’s sixth hospital. Hartford HealthCare’s chief medical officer and senior vice president, Dr. Rocco Orlando III, said standalone community hospitals are already severely challenged, and will find it increasingly difficult to remain on their own. “Having said that, the role of community hospitals is absolutely essential,” he said, citing their ability to care for people close to home. Hartford HealthCare has faced criticism for cutting back services at one of the community hospitals it owns, Windham Hospital. Hartford HealthCare officials said those cuts were needed to keep the financially struggling hospital in business. “It’s the very small places that are sort of the average daily censuses of less than 50 patients, they’re going to be challenged, and they’re particularly challenged in Connecticut,” he added. Does Connecticut just have too many hospitals? Some hospital leaders say it’s a question they hear. Charmel points to national data on the availability of beds: On average in the U.S., there are 2.4 hospital beds per 1,000 people. In Connecticut, it’s 2.1. The Massachusetts report, published last year, was inspired in part by the closures of two community hospitals and the prospect that two other hospitals would eliminate inpatient services. Researchers projected the impact on annual health care spending of the closures of other hospitals. In most cases, they found, spending on inpatient care would increase, generally by less than $4 million. In some cases, the impact would be limited because the hospitals don’t treat many patients. “Nonetheless, our analysis indicates that maintaining the availability of lower-priced community providers and encouraging patients to use them more frequently could have a significant impact on lowering health care spending,” the authors wrote. But they also suggested that the models those hospitals operate under must change. They described a need for community hospitals to become “community health systems,” a process that could include better aligning the services provided with unmet local needs, shifting inpatient facilities toward more outpatient care, and forging closer links with other types of community providers. They also described the need to encourage patients to use “high-value” health care providers, noting that many often bypass local hospitals for costlier academic medical centers, even when there’s no demonstrable difference in quality. Patients generally lack the information to evaluate hospitals based on price and quality, the report noted.